No one wants to have to go about their day knowing that they’ve left their pet at home in an unhappy state. Dogs are very social animals, and can often become anxious when separated from their owner. Anxiety is characterised by signs of distress such as toileting in the house, heavy panting, salivation, barking, howling, destructiveness, digging, pacing, or trying to escape. The following strategies can help you teach your dog how to be calm and relaxed throughout the day. They include changing your interactions with your dog when you leave and return home, altering your departure cues, exercising your dog before you leave, and other practical ways to make sure your dog is happy, regardless of whether you’re at home or not. To reduce your dog’s anxiety, you should ignore them for about 15 to 30 minutes before you leave. While keeping your departure low key and non-eventful, you should also be distant and confident. Because if you’re stressed, your dog will know and become stressed too. When you return home – whether it’s an hour, a day, or a week later, greet your dog quietly and calmly and appear nonchalant. Then, once they’re calm and quiet, you can attend to them. If you wear the same clothes, perfume, or shoes before you leave, consider mixing things up a bit. Or you could desensitise your dog by doing the things you do prior to leaving, without actually leaving. For example, pick up your car keys, move around the house, and then put them down again. Or you could pick up your car keys and put on your coat, but then sit and relax on the couch instead of leaving. This will change how your dog perceives predeparture cues (eg. picking up your car keys), and teaches them that it no longer means you’ll be leaving. This can prevent their anxiety from escalating. Give your dog a chewy treat on their bed or mat right next to where you’re sitting at home. Then increase the distance between their bed and where you’re sitting. This will make your dog relax when at a distance from you. Keep doing this until your dog can lie on their bed enjoying their treat in a separate room from you when you leave the house. You can also teach your dog to ‘sit and stay’ before you leave a room. First, ask them to sit and then take a small step back. If they sit and stay in one place, quickly return to them and give them a food reward. Over a few weeks, increase the distance between you and your dog, and the amount of time you’re both apart. This includes the times when you leave the house. Playing games with your dog, such as fetch and tug-of-war, or exercising them before you leave the house can help them to relax and rest while you’re gone. Consider walking your dog twice a day for at least 30 minutes, including a walk in the morning before you go to work. If possible, let your dog off the leash so they can run around, sniff, and socialise with other dogs. And consider taking different routes and visiting different places so they can experience new smells and sights. You could also hire a reputable dog walker and have them exercise your dog in the middle of the day. This can help to tire out your dog and reduce their anxiety as they wait for you to return home after work. Give your dog safe items to chew on, as it can help to preoccupy them while they’re home alone. You can also fill Kong-type dog toys with food that will take your dog at least 20 to 30 minutes to eat while you’re away. You could even hide your dog’s food so they have to find it, which can help to engage and preoccupy them when you’re not at home. Create a safe zone for your dog, which could be a crate, a small area in a room, or a pen where they can retreat to. Confinement helps to reduce damage, let your dog settle in their den, and wait for you to return. Crate training can help your dog learn that the crate is their safe place to go when you leave them alone. But for some dogs, the crate can add to their stress and anxiety. You can determine whether or not you should use a crate by looking at the way your dog behaves during crate training. If they show signs of distress, you could confine them to a room behind a baby gate. Get a family member or friend to come to your home and stay with your dog when you have to leave the house. If you can’t get someone you know to look after your pet, you can hire a pet sitter or dog walker from Lonely Pets Club – we offer a renowned, professional, multi-award winning and highly personalised pet sitting and dog walking service. 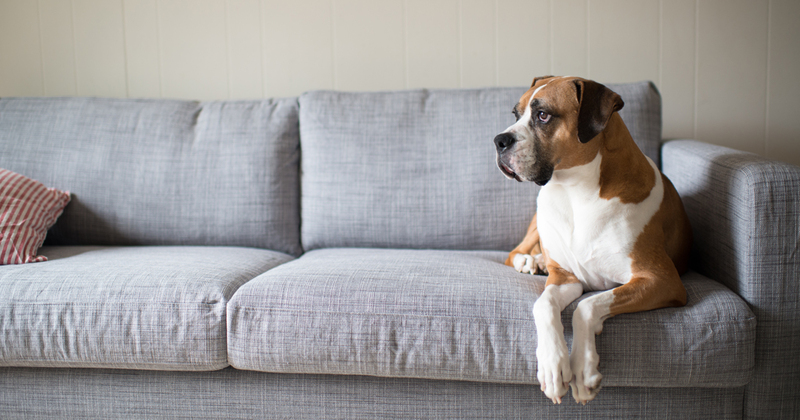 If you follow these strategies, you’ll be able to help your dog overcome separation anxiety. This will make it easier for the both of you when you need to leave the house. However, if your dog still shows signs of separation anxiety, you can speak with your local vet who can give your dog medication and behavioural modification or training to solve the problem. The sooner you can resolve the issues, the better off you and your dog will be.